Summer berries line up in little square boxes tempting us like precious jewels. Strawberries are gone from our farmers’ market, and we now see red, black or golden raspberries, and blueberries. The fairest and costliest of all are red currants. They glisten, tiny bright red berries on slender green stems; a mini-box for three dollars will scarcely make a pudding for two. 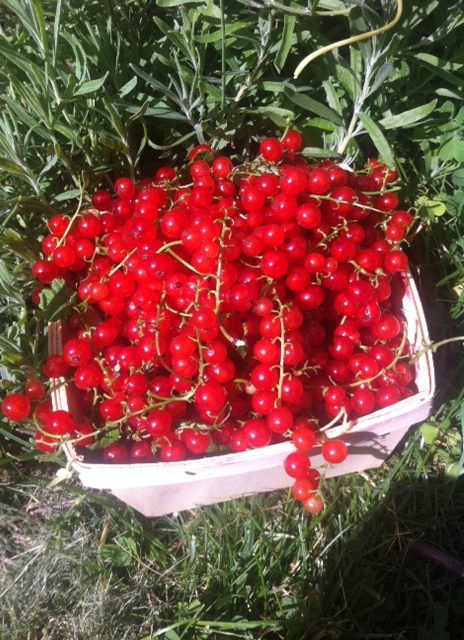 By chance I recently had permission to clean a fruit-laden red currant bush. After an hour of careful picking, I came home with two pounds of loot and a profound appreciation for the tedious work. Whenever we mention red currants, there’s confusion about the dry currant and the fresh currant. Fresh currants and dry Zante currants are not related in any way except by name, which is basically a misnomer. The Zante currants we add to cakes are dried small seedless raisins originally from the Greek island of Zakynthos. Once called Corinthian raisins, the name was soon shortened to currants. In America the only place we commonly see red currants is in currant jelly used to glaze red fruit tarts, or in Cumberland sauce for ham. The most famous of all red currant preserves is the French Bar le Duc, known as the most expensive jam in the world. To create this preserve women use goose quills to remove the small seeds from each red berry. If you’re lucky enough to have a box of fresh currants, here’s a simple method to bring the flavor of this exquisite jam to your own table. Rinse red currants, no need to remove stems. Film the bottom of a heavy pot with water, about 2 oz. (¼ cup). Add currants, cover and cook on medium heat until berries have burst. Cool slightly and pass the fruit through a food mill using a disk with small holes. Measure the resulting puree. If you have a pound, or two cups, of fruit puree, you will need the full two cups of sugar to make a tart jam. Scald two 10-12 oz. jam jars with twist-on vacuum lids. Keep the jars and lids hot in a small pan of shallow simmering water. Return the currant puree to the jam pot; bring to a boil; add sugar; stir to dissolve and return to a boil. Boil steadily for 5 minutes, stirring occasionally, for a firm jam, and just over 4 minutes for a softer preserve. (At this point you may check for the set by seeing if the jam coats a spoon or by dropping a half-teaspoon onto a cold saucer. Currants are high in pectin and the jam should set up quickly.) If the jam seems runny, boil another minute. Remove from heat and skim any foam (save for your toast), and, using a canning funnel, ladle the hot preserve into the hot jars. Wipe the tops of the jars clean if any jam has dripped. Lift the hot lids from the water and screw on immediately. Allow the jam to cool to room temperature (during which time the lids should “pop” to show a seal.) To be on the safe side, refrigerate jam until ready to use. 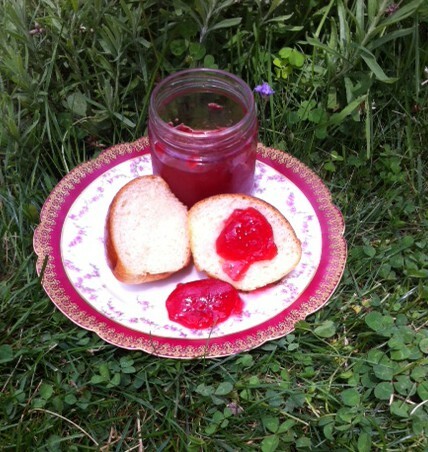 You are currently browsing the Mary Jo's Kitchen blog archives for July, 2014.